If you’re trying to reduce the amount of pesticides that may be present in your diet, butter is one of the biggest things to watch out for. Since pesticide residues tend to collect in body fat, any pesticides or chemicals that a cow has been exposed to will collect in the fatty tissues and be excreted in its milk. 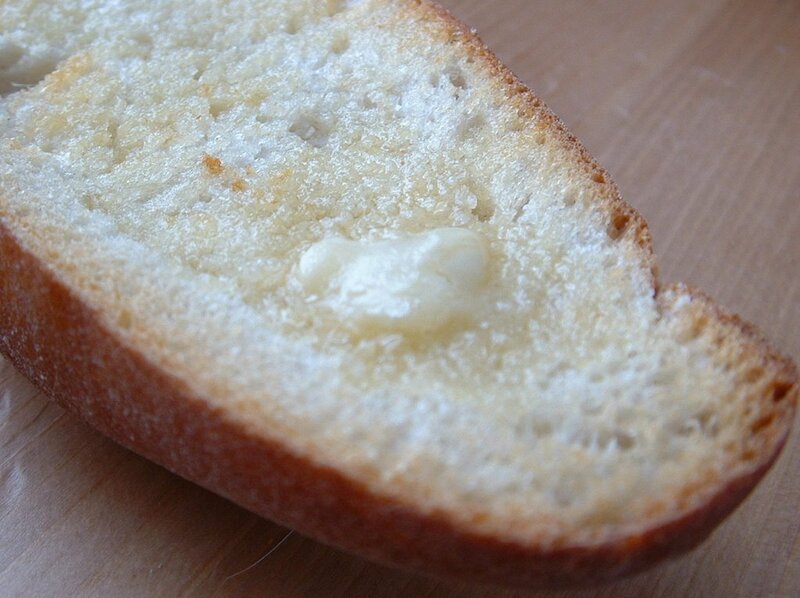 When the cream is collected and the fat separated out as butter, those residues become even more concentrated, making conventional butter a veritable chemical soup. I regularly use a great tasting non-hydrogenated margarine for eating and baking (Earth Balance and Spectrum Spread are two good ones), but sometimes nothing can replace the flavour of real butter. Unfortunately, the cost of buying organic is often prohibitive (unless the local dairy is selling it off cheap), so I started experimenting with making my own own several years ago. A quart of organic whipping cream costs me just over $3 and yields me about a pound of butter, while a pound of organic butter from the store can cost almost $9. If you’re willing to invest a little bit of time and effort, making your own is a worthwhile venture. You don’t even need a butter churn! The first step is to leave the cream on the counter long enough for it to warm up to room temperature, which makes it easier to separate the fat from the buttermilk. When it’s no longer cold, put it into the bowl of an electric mixer (fitted with the whisk attachment), food processor, or blender. You can even shake it in a jar with a couple of clean marbles (this is a fun project to do with children, but it takes a little longer). Whip as if making whipping cream, and after several minutes the butter will seize and separate from the buttermilk. 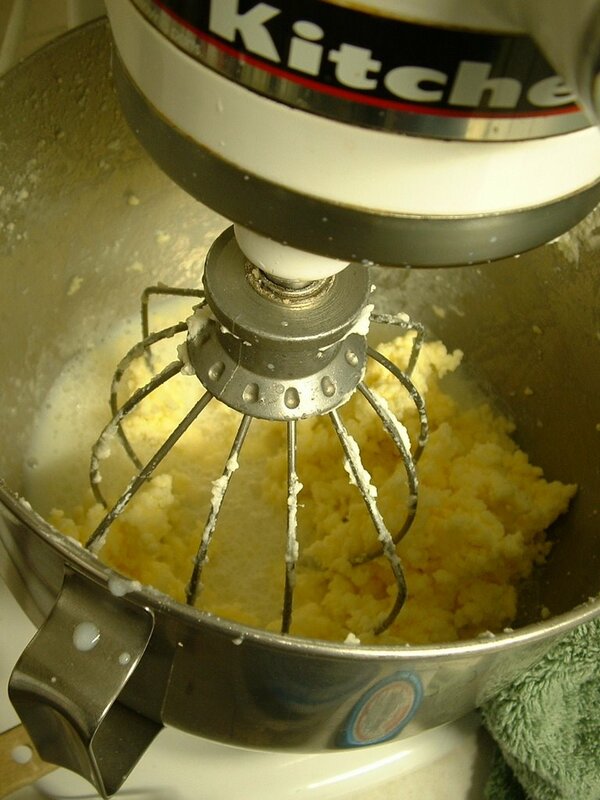 Let the mixer run until the butter comes together in a lump. If you want the butter to keep for awhile, it’s important to “clean” it, as the buttermilk will sour and ruin the flavour. Pour the buttermilk off (through a strainer) and keep it in the fridge for drinking or baking. Now add some very cold, clean water to the mixer (too warm, and you’ll melt the butter. A food processor works well if you don’t have a splash guard on your mixer, otherwise you can (carefully) drape a towel across the top of the mixer and the bowl (to keep the water from sploshing all over your walls). Turn the machine on low and let it knead the water into the butter, removing any residual buttermilk. Drain and repeat as necessary until the water rinses clean. You can also knead the butter under running water with your hands (your hands will be silky smooth for days! 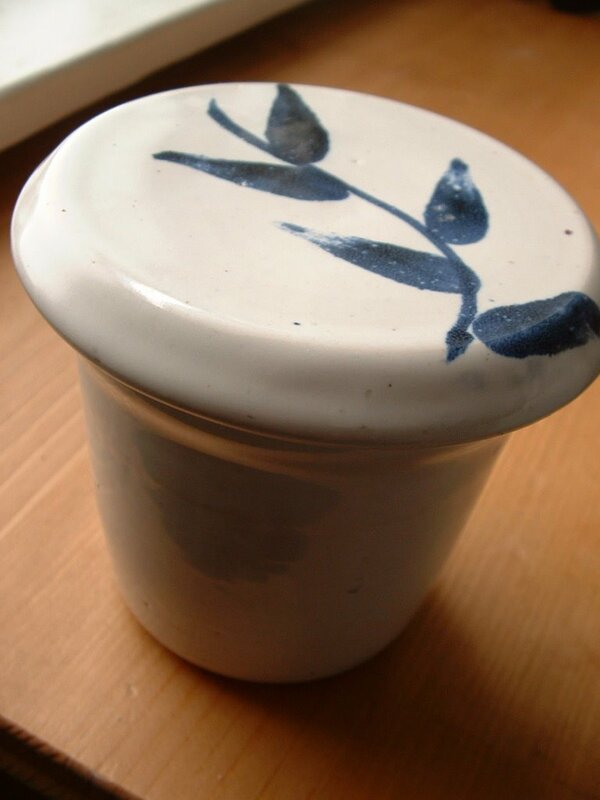 ), or shake it with cold water in a lidded jar. Now you need to get the water out of the butter, and I find that kneading in a clean towel works well for this, or you can press it flat with a spoon, pouring off any resulting water. If you want to salt your butter, dry the bowl of your mixer/processor, and add 1/2 a teaspoon of salt for every pound of butter (remembering that 1 quart of cream will yield about a pound). Mix to incorporate, and adjust salt to taste. You can also add garlic and herbs at this point. Either wrap the butter in waxed paper, or store it in a closed container in the refrigerator. My favorite way to store butter for everyday use is in a French butter bell. A butter bell consists of a large cup that holds a small amount of water, and a lid with an inverted cup suspended underneath it (I got this one at a local pottery sale). 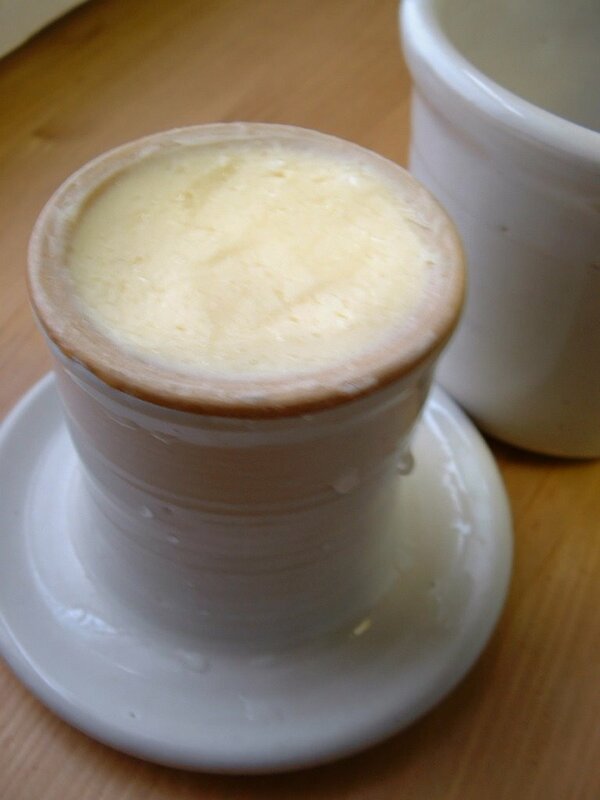 The cavity under the lid is filled with butter and placed inside the larger cup, submerging the butter. The water prevents any air from getting at the butter, which stays soft and at room temperature without going stale for a long time. The leftover buttermilk can be used to make delicious scones, pancakes, and many other baked goods. The butter itself is a luscious addition to almost anything.I can’t think of anything I’d rather have on a warm piece of toast! Delicious. I’ve made butter in my husband’s great-grandmother’s butter churn, in a mason jar, and in the Kitchenaid mixer; the mixer certainly is the easiest! I discovered your blog about two weeks ago. We’re kindred spirits, I think. Your post on roasted pear butter was a hit here on Saturday, as I finally disposed of the last of a bushel of pilfered pears into your recipe. Num! Yum. We can still buy organic butter for around 5.50-6.50, but this would be a little cheaper and more fun. I’d like to give it a shot sometime. El – I’m so glad that you’re enjoying the pear butter. Thanks for taking the time to say “hi”! Burdock Boy – That’s a pretty good price, even taking exchange into account. Sounds wonderful. this is another thing that I hope to try soon. Phelan – It’s great, especially if you have a good source for cheap cream. Hi Cheryl. I can’t wait to try this. I never knew you could make butter with the Kitchen Aid and whisk attachment. Yum. Hoping to try it very soon. Lu – Let me know how it goes. I finally got my copy of The French Farmhouse cookbook, by the way! (Haven’t made anything out of it yet though, we’ve been too busy).